About 30 volunteers of the BHAS and MSFAT Field Units assisted with the phase 2 excavation of a Bronze Age barrow on Peacehaven Heights in April this year. The barrow is very close to the cliff edge and will be lost to cliff erosion in the not too distant future. The mound is a scheduled monument sited on the crest of a hill on what is now open Downland. The cliff edge is only about 3m from the southern most edge of the barrow and encroaching rapidly (see Fig1). The mound is built on top of layers of sand and clay deposits known as Woolwich Beds that lie over the chalk to a depth of approximately 6m in this area. The silts which cover the valley down towards Newhaven would have provided fertile farming land and hence the focus for prehistoric settlement. The land now lost to the sea would have stretched for some distance but a deep marine shelf lies just a little way out and would have defined the not too distant coastal limit in prehistoric times. The north/west quadrant of the mound was the focus of the excavations. Earlier excavations of this same quadrant in 2007 revealed that the mound had been used during World War II for military purposes. The mound commands tremendous coastal views and two slit trenches had been dug by soldiers into the centre effectively removing large quantities of the interior of the earthworks. The trenches were part of the coastal defences and used to protect the radar station that once stood adjacent to the mound. Copper communication wire was found in last year's excavation, which probably linked the trenches to other gun or command posts that existed in the area. This year a mechanical digger was used to remove the turf and top soil enabling the excavation to proceed much more quickly than last time and the whole quadrant was taken down spit by spit mainly using trowels in the two weeks available. The location provided many challenges, being a considerable distance from any facilities and also subject to very bracing coastal breezes which at times made recording almost impossible. Despite this and with a courageous effort from volunteers, the excavations revealed that the large mound that exists today covers a smaller mound with an approximate 8m radius. This comprises layers of the local sandy/clay deposits as well as flint (both worked and unworked), pebbles and pieces of sandstone. Beneath the sandy layers lay the natural - a solid yellow clay. Around three thousand pieces of worked flint and waste flint flakes (débitage) were collected for analysis (virtually 95% collection). The flint work is of mixed period - Mesolithic, Neolithic and Bronze Age - and includes scrapers, piercers, blades, cores, an axe rough-out and a (probably) Neolithic arrowhead. Some 40 sherds of pottery were also recovered, most of which are prehistoric; some are of typical Bronze Age fabric with some possibly being Beaker. Other sherds look Iron Age and Roman. These are being processed prior to being sent for dating/analysis. The excavation failed to produce any evidence for a central burial but a sherd of green glazed pottery deep in the centre along with two pieces of clay pipe in the layers above it suggest the centre of the barrow has been disturbed, probably by Antiquarian robbers from the 1700-1800s. The robber trench probably corresponds with one of the craters in the mound just beyond the excavated area. Beyond this intrusion and below the flint layers we discovered a number of small pits containing burnt stone, charcoal and pot sherds. Although no cremated bone appears to have survived, these are likely to be cremation pits. Pottery and charcoal was taken from these features for dating. A number of stake- and post-holes were also revealed adjacent to and around the pits, which may indicate grave markers or some other funerary or earlier structure. However, as yet, only one quadrant has been excavated, so further excavation is needed to have the full plan of these features. Several soil samples were removed for further investigation along with several, small charcoal samples. No ring ditch was evident but shallow scoops had been removed from the hard yellow clay in an area where the ditch might be expected. This clay was difficult to excavate with modern metal tools and it may have proved too difficult for the barrow builders to dig a ring ditch. The evidence suggests that they brought in soil from the surrounding area instead - possibly from where they were living and farming down on the valley slope - and they made a mound from that. Initial analysis suggests the finds will confirm this to be a Bronze Age funerary monument. The mound has many similarities to that excavated at Crowlink in 1998, which also produced multi-period pottery, cremations and a grave, which had been covered by thousands of pieces of flint débitage. In the case of the Peacehaven mound it appears the hill-top area was first used as a "cemetery" with cremation pits being dug with possible markers or structures and, at some point after this, the pits were covered with flint and soil to make the mound. A full excavation report is being prepared and there is a possibility of returning to Peacehaven next year to remove the east section of the barrow, following discussions with English Heritage. In the meantime a finds processing day may be organised in due course to process the large amount of flint recovered from the barrow. Details will be posted on the MSFAT website in due course. I would like to take this opportunity to thank all those who dug or visited for their help and support. The dig would not have taken place without the support and funding from BHAS, MSFAT, SAS, CCE Sussex University and English Heritage and Dave Cudmore Archaeological Supplies. Archaeology South East also deserves thanks for help in determining the TBM. 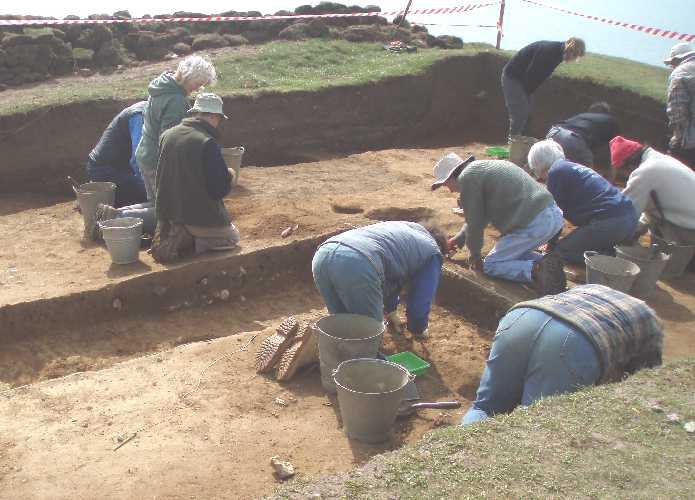 Excavations were undertaken from the end of May to the first week of July 2008 in Ovingdean on a known medieval manorial complex which appears to be enclosed by earthworks within a field known as Hog Croft to the immediate north of St. Wulfran's Church. Excavations undertaken in 2002 and 2006 had located a manorial dwelling house dating to the thirteenth century, several tumbled walls sited at a distance from the house and a well. Towards the end of the 2006 season an area which produced copious amounts of animal bone and cooking pot sherds (including an in-situ pot) was provisionally interpreted as a detached kitchen. During this current season of excavation, a survey of the site was undertaken using a Total Station; this survey has been overlaid on the earlier geophysical survey of the site and both surveys then overlaid on an aerial view of the site from Google Earth. The purpose of the 2008 excavation was to further investigate this possible kitchen area. Other than an area of burning and large volumes of fire cracked and burnt flint together with large quantities of cooking pot sherds, no evidence to confirm a detached kitchen were found. The burnt area is unlikely to be the remains of a hearth and it is situated within an east/west ditch, dated from pottery found therein to have been extant from c.1200-1400. An in-situ cooking pot found close by the burnt area is similarly dated. Whilst the evidence indicates the possibility of fire on the site (French raids along the coast are known at this time, particularly Rottingdean and Brighton which are close by), confirmation would require further archaeological investigation. A series of three rectangular post holes were identified, the second of which displayed evidence of a post pipe. These appear to run roughly north/south. On the last day of excavation a fourth post hole, of similar dimension to the first three, was located approximately six metres to the east. A beam slot to accommodate an angled timber was located in close proximity to the series of three post holes. This evidence may indicate an earlier phase of occupation on the site. However, when the building was removed in antiquity, the voids were backfilled almost immediately as indicated by a lack of stratigraphic layers and there were very few finds therein. The east/west ditch cuts this earlier building and is therefore of a later phase of occupation. Only further excavation of the site will reveal the history and archaeology of and it is hoped, subject to permissions, to return to Ovingdean in 2009. On 15 December 2007 I found a smooth, muddy "anomaly" the size of a Polo Mint amid the intractable, slag-packed Roman occupation layer within Trench 2 on the Arlington settlement site (see FLINT Spring 2008, p10). It had been in close proximity to a piece of amphora and other pottery shards, only inches from the line of a modern land drain. When it had been washed with a bit of bottled water, a striking, glacier-blue piece of glass emerged, which we christened "a bead". An exciting moment! It had, however, a curious, small protrusion on one side. It looked as though it had once been attached to something else. Not knowing much about how beads would have been made, I wondered if it could have been cast in a multiple mould and then snapped off, leaving a rough, broken edge which could perhaps have been polished away. (see Fig 1). Long after it had been found I continued to be intrigued. Why, if it was a bead, was it not perfectly round? I contacted an acquaintance, David Hill, the research half of the esteemed Roman Glassmakers team in Quarley near Andover. David and Mark Taylor have been researching and creating handsome and accurate Roman reproduction glass for many years. I sent him a photo of the bead and he sent a swift and very detailed response. Apparently, the artefact was possibly not a bead, but the terminal end of a Roman stirring rod or "swizzle stick." David had seen hundreds of these, or portions of them, on his travels. He said they were generally about 5-6 inches in length, and almost always made from a length of "candy-twist" glass rod, though plain ones are also known. They have a loop or hook at the top and the end tends to be flattened or sporting a simple shape, like that of a bird. 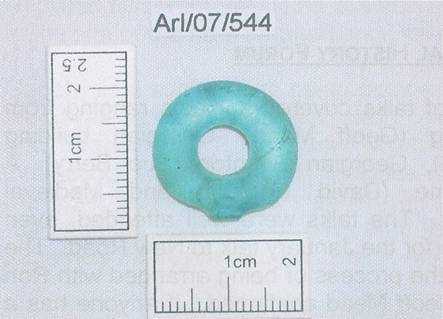 Complete examples are often found with a "captive" glass disc which moves up or down the rod. They are often found in funerary contexts. Although their function remains obscure, it has been suggested that they were cosmetic spatulas, used for dipping into long-necked unguentaria, the sliding disc (when there is one) serving as a stopper. As for the Arlington example, David said the delicate decoration around its edge is probably the remains of the almost completely re-melted rope-twist effect of the glass rod. He thought the frosty surface had been caused by "weathering or devitrification" (whereby glassy substances change their structure over time into a more stable, crystalline composition) than through abrasion in the soil. "Stirring rods" are found wherever there are Romans and certainly other examples have been found in the UK. (see Fig 2 This 1-2C AD green stirring rod recently sold at Christies in London for £1680). 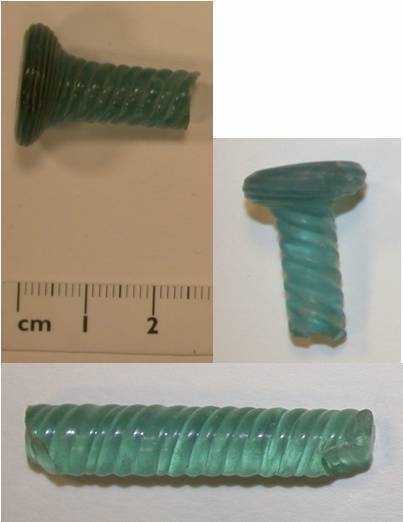 Excavations by MoLAS on the tidal foreshore of the River Thames near the City in London in the 1990s uncovered Roman warehouses which had once been workshops, one of which produced twisted glass stirring rods and small blown bottles. The Museum of London has both entire and fragmentary examples of these in its collections. Editors Note: I have been asked to point out that although Diana's article is well researched Greg is waiting until the find in question has been physically seen by an expert before finally identifying it.